Elder Scrolls Online Becomes Buy to Play! Hello guys! We have very exciting news for you! Many of ESO players were unsatisfied with Subscription Based game model. Such model requires players to pay monthly fee in order to be able to access the game. Fortunately, developers decided to change the game model and make ESO Buy to Play (B2P)! 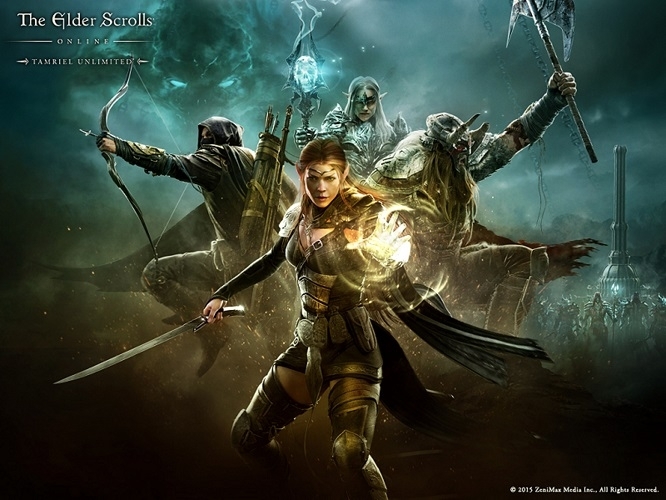 Elder Scrolls Online becomes Buy to Play on the 17th of March 2015 for PC and Mac. Developers also decided to change the game title: new game will be called The Elder Scrolls Online: Tamriel Unlimited. It’s the same ESO but without monthly fees! Now everybody can just purchase the game and enjoy playing without any regular fees! Unfortunately these changes don’t make the game absolutely free. There will be special in game shop called Crown Store where convenience, customization items (such as pets and mounts) and special DLCs can be purchased. New in-game currency called “Crowns” will be added. This currency can’t be found or looted inside the game. You need to purchase special Crown packages at the online store or ESO Plus Subscription. There are different ESO Plus membership plans: 30-day, 90-day and 180-day. You will receive different amount of Crowns in the beginning of the period. The amount of crowns depends on the plan you have selected. ESO Plus membership also gives access to all downloadable content and 10% bonuses to experience gain, crafting research, crafting inspiration and gold acquisition. How to Upgrade to Tamriel Unlimited? If you have already purchased ESO and have it installed you will get Tamriel Unlimited update for free. All you need is to launch the game on the 17th of March or later and a new patch will be applied. The remaining subscription time will be automatically transition to ESO Plus membership. You will get new currency and bonuses described above. There will be no refunds, but you can cancel ESO plus membership if you want. If you have never played ESO you will have to pay for the game and enjoy it without any subscription fees. You will get the full ESO game with all previous upgrades. You can play the game for free, no subscription is required. If you want to get more content and special bonuses you can get ESO Plus membership. As you see the changes are global. Developers of the Elder Scrolls Online understood that their subscription model doesn’t attract new players. It was predictable. Monthly fee was one of the most important factors that stopped new players from purchasing the game. The first wave of post-launch excitements was over and developers understood that players are leaving ESO because most of them don’t want to pay monthly fee. Changing of the game model will most likely attract new players. Now the game is not as expensive to play as it was. But to be honest, new model will also require money spending. There will be special DLCs you can access after purchasing. But anyway ESO will become friendlier. It will be possible to start the game without any DLCs and memberships. On our opinion it’s great. All these global changes may give ESO a new chance. Who knows, maybe this new model will make ESO more attractive. What do you think about these upcoming changes? Share your opinion in comments below. Well I'm getting ESO now it's B2P, I think it was a great move! If you never used your account's complimentary 30 day subscription before ESO went BTP, then your 30 day sub will be converted into a 30 day ESO Plus Membership (activated through your account). Very nice.